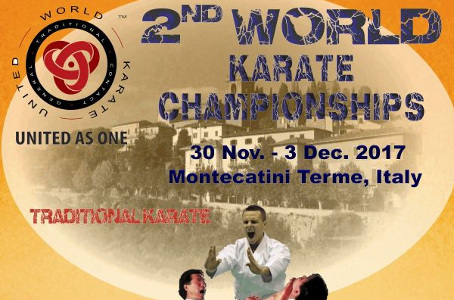 The Official XIXth ITKF Traditional Karate World Championship will be held from November 30 to December 3, 2017 in Montecatini-Terme, Italy. November 29 – Registration of Officials, Teams and VIPs. Registration Room – Croce di Malta Hotel. November 30 – 3:00 pm – ITKF Special General Meeting (ITKF National Federation Members only) – Croce di Malta Hotel. All ITKF membership dues must be current and paid in full up to and including the year (2017). If your federation still has not brought your dues up to date, please be sure to send payment to the ITKF office by the time of registration deadline – November 13, 2017. Arrangements made in advance will allow payment in Montecatini. Note: If athletes have not yet registered their Dan rank with ITKF, please send the Dan Registration Application form and fees to the ITKF office by October 31, 2017. Please contact the ITKF Office (See e-mail below) for the Dan Registration form and information on fees and payment procedure. ITKF Judges must have their technical qualifications registered with the ITKF office. If your judges have not yet sent their qualification renewal forms and fees to the ITKF Office, please urge them to do so by October 31, 2017. If you have questions or need the required Dan registration or Technical renewal forms, please contact the ITKF Office at: office@itkf.org.